Get cogent answers to thorny questions. There’s a lot more to ultimate than just the Xs and Os. While your coach or captain might be able to help you diagnose a mechanical problem with your forehand, a lot of times, you might find yourself looking for answers to social or financial questions. 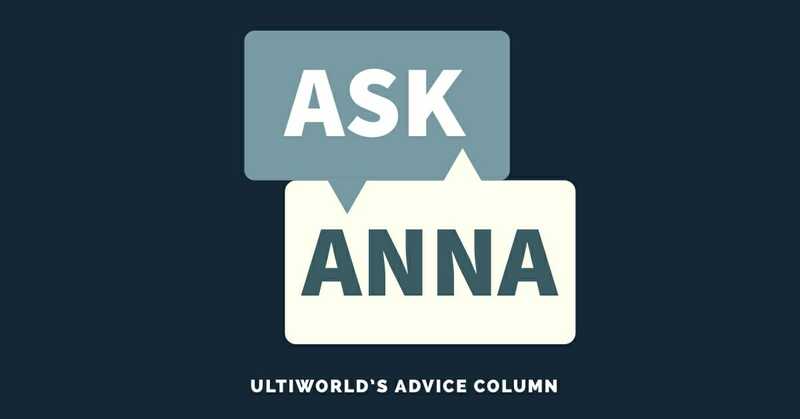 To that end, welcome to a new advice column on Ultiworld: Ask Anna! You can reach Anna at askanna@ultiworld.com with any questions that you have. Q: I’m a fairly new ultimate player. I started playing at my college two years ago on the women’s B team, but I moved up to the A team this year. I decided to play summer league while I was home for the summer to get better. Here’s the problem: I often didn’t get thrown to, even if I was getting open, especially by the men on the team. I drop it sometimes, but usually I’m pretty good at catching, and I don’t throw it away often because I usually just look to get it to a handler. What should I do? I’m worried about playing again this summer. A: There are a variety of reasons you might not be getting the disc and you should first make an effort to diagnose the problem. Is it a pattern of one (or multiple) men on the team not throwing to any women? Is it a particular player that keeps looking you off? Could you be opening up space for other players to get the disc? Keep in mind the value of hard cuts, even if you don’t get the disc. Catching after a cut to gain yards feels like the most valuable contribution in a game, but the smooth offense relies on having multiple viable options, and creating space is vital for that. It may be that the particular handler doesn’t have that throw or wasn’t sure you had separation, and talking through it can help the two of you communicate about how connecting on the field. There’s also a difference between what men and women interpret as separation, or the relative openness of a cutter; if a handler is accustomed to playing Men’s only, they may be looking for an unnecessarily large amount of distance between you and the defender. Talking through specific scenarios will help both of you calibrate and decide on what is actually open. Finally, make a point to throw before or after games with different people. It gives you a chance to get more comfortable talking with your teammates and gives them a sense of how you throw and catch so you’re more familiar on the field. You’re making a great investment in your game by playing over the summer – keep it up! Q: I just moved to a new city last winter. Like many, I wanted to get involved with ultimate right away to meet people and settle in. Pickup was good, but I knew I wanted to play club. I had been playing mixed club for a few years where I used to live. But at tryouts, I was nervous and really played a lot worse than I am capable of. Unsurprisingly, I got cut, even though I know I am good enough to be a starter on the team. How can I be more confident when playing with unfamiliar players? A: I’m sorry that you don’t feel you played up to your potential! I think some people thrive under stress and uncertainty, but for most, moving to a new place, playing under pressure to perform and with unfamiliar people would be stressful and unlikely to result in the best day of play. Knowing how to have confidence depends a little on knowing your perfect conditions. Do you play best when you’re relaxed and in the “zone” and not overthinking every cut? Or do you play analytically and need to be hyper-focused? Or something else? Whatever it is, practice that mindset. Before your next league game or this year’s tryout, imagine it’s a high stakes situation. Pick a few things you can do beforehand to get in your zone: maybe throwing reps with a friend, eating a favorite snack, or repeating a cue to stay focused on your goal. Practice that league game like it’s a tryout, and then debrief with yourself afterward. Did you play well? How do you feel about your decisions and execution? What went well and what would you like to focus on next time? And then practice what works for the next time. Knowing what controllable conditions are likely to result in you playing your best will help you replicate those conditions in the future. Hang in there, and welcome to whatever city you’ve landed in! Q: At the end of tournaments, our team always shotguns beers or does some sort of drinking activity. I’m not into it, but get mildly heckled if I decline. It’s not that I don’t drink – I do, at parties, or over dinner – but I don’t like to drink after I play. What do I do to hang out with my team, which I like being around, without feeling pressured into chugging beers? A: I’m annoyed for you and am inclined to tell you to find a new team that easily respects your drinking decisions the first time you make them. But, if you think they warrant your continued presence, here are my suggestions. The next time someone heckles your decision to not drink, tell them, “Knock it off. I wouldn’t hassle you if you didn’t want to drink and would appreciate the same courtesy.” Say it seriously and don’t make it a request. Hopefully, they’re embarrassed by their behavior and stop. When they start getting ready to drink, make yourself scarce. Do a cool down jog, do some yoga, read a book. Come back when they’re done and you’re ready to hang out with them. Enlist an ally. Maybe someone else on the team you’re close with, or you think would hear you out, or maybe would join you in your anti-shotgunning stance. Let them know what’s bothering you, and ask for their back up or interference next time it happens. Anna is Ultiworld's advice columnist. She is a long-time ultimate player that's navigated college, club, and league competition (and social scenes). You can reach her at askanna@ultiworld.com. Comments on "Ask Anna: A New Ultimate Advice Column"